Tuberculosis (TB) is a curable and preventable disease, yet it imposes an enormous health and economic burden on India. It is estimated that the private sector in India treats about 50% of all TB patients. To achieve enhanced TB control, it is essential to ensure universal access to high quality TB diagnosis and treatment through engagement with both the public and private sectors. Engaging the private sector effectively has been a continuing challenge for TB control. The private sector in India is highly unorganized and is not effectively monitored. The Government of Bihar launched an ambitious and innovative pilot project to tackle TB on November 21, 2014 in Patna. Flagged off by the state’s former Health Minister, Mr. Ramdhani Singh, the “Universal Access to TB Care” pilot is an initiative that focuses on proactive private sector engagement. It seeks to transform urban TB control in India by educating private practitioners, testing centres and pharmacies on best practices essential for effective TB control. India has the highest burden of tuberculosis (TB) in the world, accounting for one-fourth of the global TB burden alone. Annually, the country witnesses approximately 2.3 million new cases, 300,000 TB deaths and additionally, a million “missing” patients languishing in the largely unregulated private healthcare sector. Although India has taken tremendous steps towards tackling this deadly disease, these efforts have been limited in their impact and reach, owing to the sheer magnitude of the country’s TB epidemic. Large cities present a distinct challenge to TB prevention and control. Although urban living offers potential access to better health care, urban environments can also lead to health risks and new hazards. Urbanization is a leading contributor to the rampant spread of TB in major cities such as Patna. As a highly contagious and airborne disease, TB finds the ideal conditions for transmission in crowded and unhygienic spaces, particularly slum areas. The poor are especially vulnerable to the disease as malnutrition compromises their immune systems. However contrary to common belief, TB is not just a disease of the poor — it can be contracted by anyone upon exposure, irrespective of their economic status. The daunting scale of India’s TB epidemic cannot be fought by the public sector alone. An inclusive approach focused on private sector engagement in TB control is imperative, together with stringent measures to mitigate malpractices in TB care and ensure mandatory notification of TB cases. This initiative in Patna will focus on engaging qualified doctors, informal medical practitioners, chemist shops and diagnostic facilities in the private sector, using a technology-based reporting platform, and an inclusive system of financial and service incentives. The initiative is aimed at motivating and facilitating appropriate delivery of TB diagnosis and treatment in Patna, wherein the private sector and state authorities join hands in a combined effort to combat this deadly but preventable and treatable disease. As part of the private sector engagement program, leading diagnostic facilities are being brought on board to provide subsidized sputum testing for TB diagnosis. Chemists will be sensitized to not sell TB medication over-the-counter without a prescription. Private healthcare practitioners are being encouraged to ensure notification of positive TB cases and educate patients about the criticality of treatment adherence. On 30 January 2016 an organized a site visit for leading Parliamentarians Shri. Jitin Prasada, Congress leader and former Human Resource Development Minister (MoS) and Shri. Kalikesh Singh, Member of Parliament from Balangir in Orissa. The two politicians visited the Universal Access to TB Care pilot project in Patna where the State’s TB cell has partnered with WHP, a local NGO partner to provide diagnosis and treatment services to TB patients. WHP is acting as the Public Private Interface Agency (PPIA) and supports the State TB Cell to reach out to patients who prefer to go to the private practitioners for TB diagnosis and treatment. Launched by former Bihar health minister Mr. Ramdhani Singh in November 2014, the project focuses on engaging existing qualified, informally qualified providers, chemist shops and diagnostic facilities in the private sector using a technology-based reporting platform, and an inclusive system of financial and service incentives. Mr. Prasada and Mr. Deo met with Dr. K N Sahai, State TB Officer, Bihar and Dr. Pranati, WHP who briefed them about TB in the state. Dr. Sahai mentioned that the government of Bihar has realized that TB requires continued focus and is not a problem that can be solved overnight. It needs targeted approach and programmes like PPIA under the UATBC model has helped the government in its TB control efforts. Noticing the achievements, the government decided to expand the programme into rural Patna in 2015. 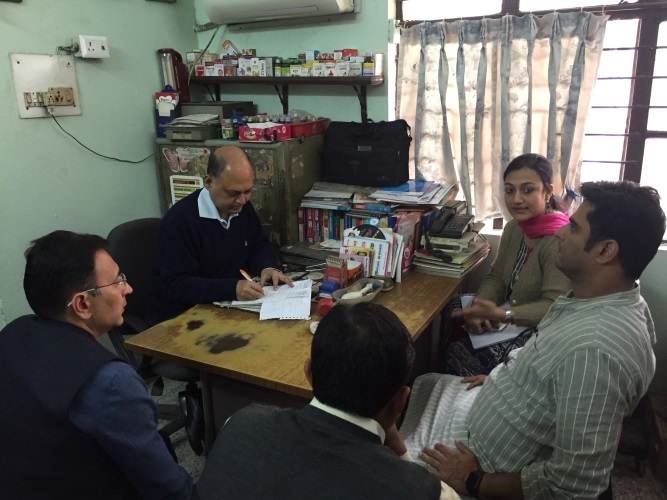 Dr. Sagar Bhattacharya from Aruna Clinic who is one of Patna’s leading private practitioners briefed the two leaders about the functioning of the programme. He mentioned that many of his patients are poor and therefore, the treatment dropout rate was high primarily due to financial reasons. This has amplified the problem of drug-resistant TB in Patna. He said that the PPIA project needs to be scaled up so that more and more patients complete their treatment. He also mentioned that the problem of MDR-TB in Patna is bigger than one would imagine and it needs immediate attention of the policy makers, both at the center and state. In Patna, TB is a bigger problem than HIV. Unfortunately, there is only one TB center to cater to patients in the city. In addition, the two leaders also met a local chemist who told them that the functioning of the voucher system is very efficient and the money is transferred to their account in time. Mr. Prasada and Mr. Deo also met with two TB patients who are getting free medication through the PPIA model. The two patients told them that they are regularly taking their medicine and are feeling much better now. Additionally, the leaders also visited a TB lab and the call center from where the vouchers are generated for free treatment and diagnosis of the patients. The project has engaged over half of qualified doctors and chemists in Patna in less than a year. Private sector notification has risen tremendously with over 7,790 private patients notified. Their free-treatment has been initiated under the Directly Observed Treatment, Short Course (DOTS) programme. The effective use of ICT technology through Nikshay where e-vouchers are generated for patient treatment and adherence has brought efficiency, transparency and trust in the Public Private Partnership model being followed in Patna. The model has also helped in sensitizing the providers about Standards for TB Care in India (STCI) by setting a feedback loop and not entertaining incorrect prescription.